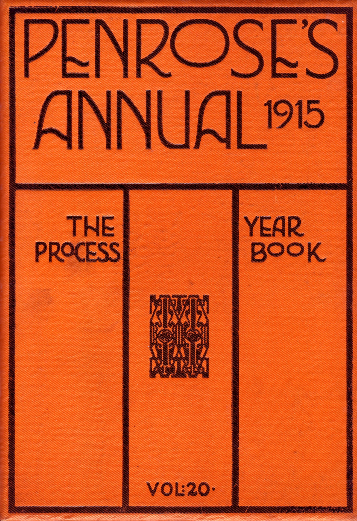 Penrose Annual, also known as Penrose Pictorial Annual. A Review of the Graphic Arts originated as the Process Work Year Book in 1895. Edited by William Gamble between 1895-1933. Essentially, each volume was divided into three sections – articles on fine printing, commercial art, typography, book design, posters, poster stamps, illustration and related areas; technical articles on printing and typesetting; followed by a series of illustrations showing examples of work by various British printing firms. Notable among contributors to the Penrose Annuals were E.O Hoppé, C.E.K. Mees, Jan Tschichold, and Lászlo Moholy-Nagy.